Some would describe Irving Berlin’s ‘Annie Get Your Gun’ as the epitome of ‘Golden Age’ musical theatre. Some would describe it as an old-fashioned cliché. Whichever category you fall into, the opening chords of the production’s overture are a true testament to why this particular golden oldie has withstood the test of time. The sharp shooting heroine first burst onto the musical theatre scene nearly 70 years ago, proving an celebrated hit on Broadway, in the West End and with numerous amateur societies on both sides of the Atlantic. This is the second time in nine years that Annie has ‘got her gun’ in Edinburgh (last seen at the city’s Festival Theatre); however the ill-fated 2005 tour endured an early closure due to its ongoing struggle to find an audience. Director Ian Talbot’s 2014 revival however, does not warrant the same consequence. Granted, it will never pull any revolutionary triggers (no pun intended), but what it will do is ensure the entertaining retelling of a good, old fashioned classic. 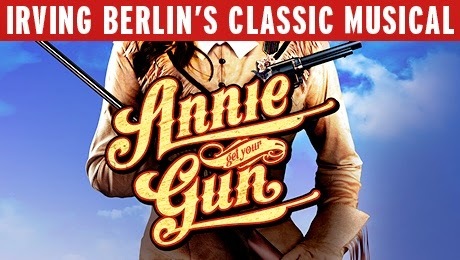 ‘Annie Get Your Gun’, focusses on story of Annie Oakley, a sharpshooter in Buffalo Bill’s Wild West Show and her boisterous yet turbulent romance with fellow sharpshooter Frank Butler. The current UK tour is based on the 1999 Broadway revival by Peter Stone, which reset the production as a ‘show-within-a-show’ presented in a big-top circus. Talbot’s new production matches it’s 1999 counterpart perfectly, but fails to add that little bit of ‘je ne sais quoi’ and as a result, appears somewhat cheap and cut-rate due to its much smaller set and use of limited signature props in order to move from scene to scene. Despite this, designer Paul Farnsworth’s circus-themed set is both colourful and vibrant (albeit a little sparse-looking at times), allowing just enough space for the visible onstage band, who sit casually in costume around perimeter of the tent. Selected projections/backdrops are displayed to further enhance scene changes which are complimented superbly by Jason Taylor’s lighting design, bringing the overall big-top circus format to life. Star attraction Jason Donovan as Frank Butler (alternating with Jonathan Wilkes at certain performances) does not live up to his headlining title and appears to struggle on both vocal and acting levels throughout the course of the production. The true star of the show however is leading lady, Emma Williams as Annie Oakley. Williams’ infectious portrayal is spot on from the moment she steps on the stage, displaying superb vocals and terrific comic timing, leading Donovan to appear somewhat miscast opposite her. A difference which became excruciatingly apparent during the show’s famous number ‘Anything You Can Do, I Can Do Better’, in which Butler and Oakley competitively try to outdo one another. Williams’s Oakley need not try very hard, proving far superior from the offset. A notion that was acutely evident during the much anticipated “I can hold any note long than you” moment. In the supporting roles Yiftach Mizrahi and Lorna Want as lovebirds Tommy and Winnie prove utterly adorable in their romantic subplot and cutesy duets ‘I’ll Share It All With You’ and ‘Who Do You Love, I Hope?’ A particular mention must also go to the ensemble who worked their socks off throughout the course of the show, notably making the most of Lizzi Gee’s energetic, thigh slapping choreography, showcased expertly in act two’s ‘I Got the Sun in the Morning’. A definite highlight. In an age of new musical theatre writing, ‘Annie Get Your Gun’ proves a rather aged and antiquated narrative despite Talbot’s efforts of a more contemporary vision. However, it takes something quite special to withstand the test of time in theatreland and ‘Annie Get Your Gun’ undoubtedly proves a show can indeed age gracefully. Composer Irving Berlin declared ‘there’s no business like showbusiness’ – a lyric that will forever resonate throughout all genres and ages of theatre both now and in the future.